In 2 qt/2 L glass or plastic pitcher, stir sugar, orange liqueur and vodka until sugar is dissolved. Into another 2 qt/2 L glass or plastic pitcher, pour half of vodka mixture. 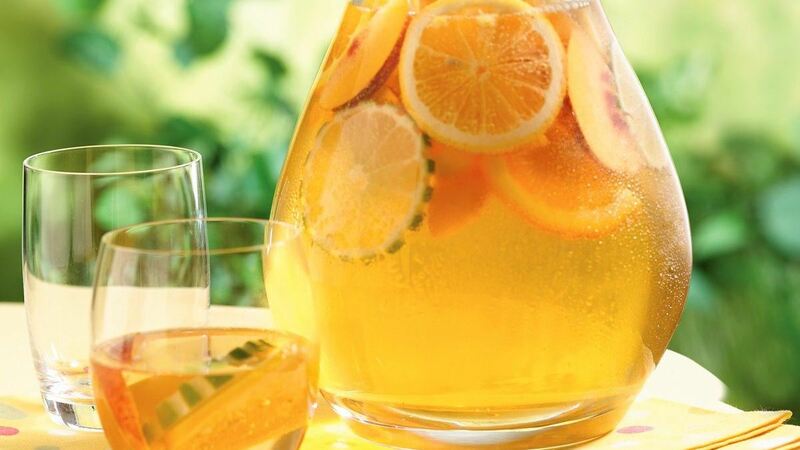 Divide fruits and wine evenly between pitchers. Refrigerate until serving. Just before serving, pour half of club soda into each pitcher; stir gently to mix. Serve immediately. If desired, serve over ice. Did You Know? : The nice thing about this fruity, refreshing drink is that inexpensive liqueur, vodka and wine can be used because the flavour does not rely solely upon alcohol. Try Triple Sec for the orange liqueur and a Chablis Blanc or Chardonnay for the dry white wine. Special Touch: For a decorative effect, cut notches out of the citrus peel on some of the fruit slices.